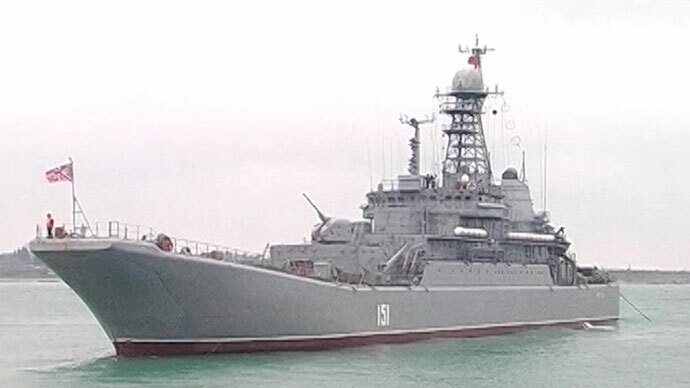 A ship of the Russian Black Sea Fleet during large-scale military exercises Russian President Vladimir Putin ordered while flying back from the South African Republic to Moscow. (Screen shot of a video of Zvezda TV channel). Is there a connection between events in Syria (maybe even US tension with North Korea) and Russia’s impromptu Black Sea war games that started on March 28, 2013?While on his way from Durban in South Africa, where the BRICS — Brazil, Russia, India, China, and South Africa —announced they were forming a new development bank to challenge the IMF and World Bank, Russia’s Vladimir Putin gave the go ahead for unscheduled war games in the Black Sea. By themselves the games mean little, but in a global context they mean a lot. According to the Kremlin, the war games involved about 7,000 Russian servicemen, Russian Special Forces, Russian Marines, and airborne rapid deployment troops. All of Russia’s different services were involved and used the exercises to test their interoperability. 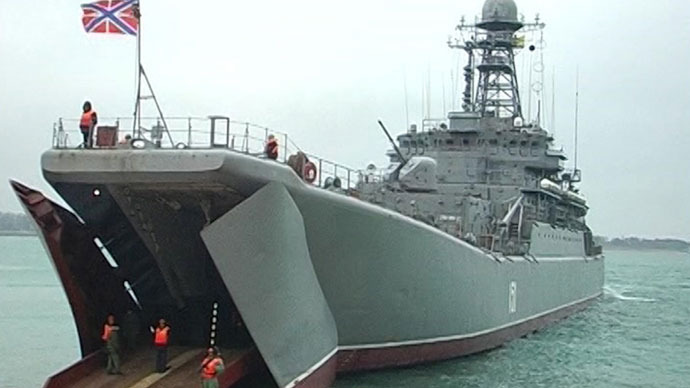 Over thirty Russian warships based out of the Ukrainian port of Sevastopol in the Crimean Peninsula and the Russian port of Novorossiysk in Krasnodar Krai will be participating. The objective of the games are to show that Russia could mobilize for any event at a moments notice. The war games surprised the North Atlantic Treaty Organization (NATO). Who even complained the Russian war games started in the Black Sea without prior notice. In fact, NATO asked Russia to be more open about its moves and give NATO Headquarters in Brussels notice of its military movements in the future. Alexander Vershbow, the American Deputy Secretary General of NATO, even demanded “maximum transparency” from Russia. One may ask, why the rattled bones? Russian response to war plans against the Syrians? Is it mere coincidence that Russia is flexing its muscles after NATO revealed it was developing contingency plans for a Libya-style intervention in Syria on March 20? Two days later, Israel and Turkey ended their diplomatic row through a timely agreement that was supposedly brokered by US President Barack Obama in twenty minutes while he was visiting Israel. Israel’s Prime Minister Benjamin Netanyahu announced that with Obama’s help a deal was made with Turkey’s Prime Minister Recep Erdogan to end the diplomatic rift over the Israeli attack on the Mavi Marmara in 2010. Days later, this event was followed by the Syrian National Coalition (SNC) — a phoney opposition organization constructed by the US, UK, France, Qatar, Saudi Arabia, and Turkey — being ceremoniously given Syria’s seat at the Arab League. In what appears to be an attempt at repeating the Libya scenario, the SNC is being recognized as the government of Syria. At the Arab League summit, the SNC’s leader Moaz Al-Khatib immediately called for NATO military intervention in coordination with Qatar’s call for regime change and military intervention in Damascus on March 26. In a stage-managed move, the puppet SNC has asked the US, UK, France, Qatar, Saudi Arabia, Turkey, and NATO to enforce a no-fly zone with the aim of creating a SNC-controlled emirate or enclave in northern Syria. Al-Khatib has announced that he has talked to US Secretary of State John Kerry to use the NATO Patriot Missiles stationed in Turkey to create the no-fly zone over northern Syria. Effectively what he is talking about is the balkanization of Syria. Kerry seems to be on top of it. Victoria Nuland, the spokeswoman of the US Department of State, said the US is considering the request about imposing a no-fly zone. Even earlier, Kerry made a surprise visit to Baghdad and threatened the federal government in Iraq to fall into line with Washington’s regime change plans against Syria. He said he wanted the Iraqis to check Iranian passenger planes heading to Syria for weapons, but much more was said. The American Empire’s satraps are all on the move. Qatar and Saudi Arabia no longer hide the fact that they are arming and funding the insurgents in Syria. In February, the UK and France lobbied the rest of the European Union to lift its Syrian arms embargo, so that they can openly arm the anti-government foreign fighters and militias that are trying to topple the Syrian government. Israel and Turkey have been forced to mend fences for the sake of the Empires war on the Syrians. According to Agence France-Presse, the Israelis have even opened a military field hospital to help the insurgents topple the Syrian government. The military facility is located in an area named Fortification 105 in Syria’s Israeli-occupied Golan Heights (originally referred to as the Syrian Heights in Israel). It is essentially a support base for anti-government forces and only the tip of the iceberg in regards to Israeli involvement in Syria. Israel’s January strikes on Syria were the fruits of the cooperation between the Israelis and insurgent militias. Sensing the suspicious eyes gazing at the Turkish government and perhaps getting unnerved by the Kremlin’s muscle flexing, Turkish Foreign Minister Ahmet Davutoglu has rejected he claims that Tel Aviv and Ankara were closing ranks against Syria. Davutoglu must have been unaware of what was said in Israel about their rapprochement. Even though Netanyahu vowed never to apologize for the killing of Turkey’s citizens on the Mavi Marmara, Tel Aviv’s apology to Turkey was publicly justified by the Israeli government on the basis of addressing Syria through coordination with Turkey. Many of the suspicious eyes that turned to look at the Erdogan’s government over the deal with Israel are Turkish. Davutoglu actually lied for domestic consumption, knowing full well that the Turkish public would be outraged to know that Prime Minister Erdogan was really normalizing ties with Israel to topple the Syrian government. The American Empire is arranging the geopolitical chessboard with is satraps in its ongoing war on Syria. Perhaps it plans on using Israel to do a re-play of the Suez Crisis. In 1956, after Egypt nationalized the Suez Canal, the UK and France drew a plan with Israel to annex the Suez Canal by getting Israel to attack Egypt and then claiming to intervene militarily as concerned parties who wanted to keep the Suez Canal safe and open for international maritime traffic. A new assault against Syria under the banners of the Israelis is possible and could be used as an excuse for a Turkish and NATO “humanitarian invasion” that could result in the creation of a northern humanitarian buffer zone (or a broader war). A pattern can be depicted from all these events. At the start of 2013, Russia held major naval drills in the Eastern Mediterranean against a backdrop of tension between Moscow and the US-led NATO and Gulf Cooperation Council (GCC) coalition that has been destabilizing Syria. After the US and its anti-Syrian coalition threatened to intervene militarily and deployed Patriot missiles on Turkey’s southern border with Syria, a Russian naval flotilla was dispatched off the Syrian coast to send a strong message to Washington not to have any ideas of starting another war. In turn, the US and its allies tried to save face by spreading rumours that the Kremlin was preparing to evacuate Russian citizens from Syria, because the Syrian government was going to collapse and the situation was going to get critical. Paralleling the Russian war games in the Black Sea, the Russian Air Force held long-range flights across Russia. This included flights by Russian nuclear strategic bombers. On the other end of Eurasia, China also conducted its own surprise naval war games in the South China Sea. While the US and its allies portrayed the Chinese moves as a threat to Vietnam over disputed territory in the South China Sea, the timing of the naval deployment could be linked to either Syria (or North Korea) and coordinated with Russia to warn the US to keep the international peace. In a sign of the decline of the American Empire, just before the Russian war games in the Black Sea, all the increasingly assertive BRICS leaders warned the US against any adventurism in Syria and other countries. The Russian and Chinese muscle flexing are messages that tell Washington that Beijing and Moscow are serious and mean what they say. At the same time, these events can be read as signs that the world-system is coming under new management. تستهلك الإمبراطورية الأميركية مزيدا من الوقت في محاولات يائسة لدفع الكؤوس المرة التي تنتظرها مع التسليم المستحق بهزيمتها في سورية بانهيار هيمنتها الأحادية على العالم و برضوخها لقدر الشراكة السياسية القهرية مع روسيا و الصين اللتين انتقلتا إلى الهجوم الاستراتيجي انطلاقا من صخرة الصمود السوري الثابتة في مجابهة الحرب العالمية التي تستهدف الدولة العربية السورية الحرة و المقاومة فما هي تلك الكؤوس المرة التي سيجبر الأميركيون على تجرعها. أولا كشف الخبير العالمي في قضايا الطاقة البروفسور مايكل كلير الكثير عن خفايا الاهتمام الأميركي الاستراتيجي المتصاعد بمنطقة الباسفيك في دراسة كشف فيها عن وجود كميات هائلة من الغاز و النفط تحت الجزر المتنازع عليها بين الصين و اليابان و في هذا المجال الآسيوي الهام توجد دولة عملاقة هي الصين و دولة “عاصية ” متحالفة معها و تحظى بدعمها و هي مقيمة على لوائح الإرهاب الأميركية منذ زمن الحرب الباردة و لم تفلح جميع ادوات الحصارو التحريم في تركيعها و هي تغالب المشيئة الاستعمارية منذ انهيار الاتحاد السوفيتي و قد نجحت في سلسلة من المناورات الذكية بشأن ملفها النووي فقاومت الضغوط الأميركية والتفت عليها و بعد تفكيك مفاعلاتها النووية و ختمها بالاسمنت أعادت إنهاض مشروعها بعد حرب تموز 2006 و مع ظهور ملامح التبدل في التوازن العالمي و كوريا الديمقراطية هي دولة زوتشيه التي تعني بالكورية الاعتماد على الذات ، كناية عن شعب واسع العلم و الثقافة و معبء بقوة بفكرة الاستقلال و التطلع لتوحيد الوطن الكوري الذي مزقته الإمبريالية الأميركية في الخمسينات من القرن الماضي . ثانيا مع تراكم مظاهر الفشل و الغطرسة الأميركيين في التصميم على مواصلة الحرب العدوانية التي تقودها الولايات المتحدة ضد الدولة الوطنية السورية قررت روسيا و الصين تسديد لكمة موجعة ترغم الإمبراطورية العجوز على استعادة شيء من العقلانية في سلوكها السياسي الأحمق الذي تبدى بانقلاب أوباما على التسوية المتفاهم عليها مع الروس بشأن وقف العدوان على سورية و الكف عن إرسال الإرهابيين و تزويدهم بالمال و السلاح و هو عرض تضمن دفع اوباما للاعتراف بالهزيمة مع حفظ ماء الوجه الأميركي تجاوبت معه سورية لتوفير التضحيات و الالام على شعبها لكن الولايات المتحدة التي انقلبت سوف تضطر لدفع كلفة أعلى من مجرد الإقرار بالفشل كما تشير الوقائع المتحولة . بدعم روسي صيني و بمؤازرة سياسية واضحة من هذين الجبارين ترفع بيونغ يانغ التحدي في وجه الإمبراطورية العجوز الفاشلة بقيادة حفيد الزعيم التاريخي كيم إيل سونغ الذي أقام قلعة صناعية ضخمة أجبرت صواريخها الجاهزة باراك أوباما لطلب معونة بكين و موسكو في احتواء حدث أشد خطورة من ازمة الصواريخ الكوبية في الخمسينات من القرن الماضي . ثالثا سوف يتوسع جدول الأعمال على طاولة المباحثات الصينية مع الإدارة الأميركية حول الأزمة الكورية بعدما اضطرت الولايات المتحدة للاعتراف بجدية التهديد الكوري بعد إنكار و اتخذت قرارها المعلن بنشر بطاريات الصواريخ المضادة للصواريخ تحسبا من تنفيذ الأمر القيادي المصادق عليه الذي تبلغته القيادة العليا للجيش و القوات المسلحة الكورية التي أعطت سلاحها الصاروخي إحداثيات عسكرية في قلب الولايات المتحدة و حملت القواعد الأميركية في آسيا كأهداف جاهزة للقصف . مستقبل العالم سيكون في صلب التفاوض الدولي الذي يوشك ان ينطلق و بنود التفاوض تتركز من وجهة النظر الروسية الصينية على تصفية الهيمنة الأحادية الأميركية ووقف العدوان على سورية و الاعتراف الصريح بالهزيمة امامها و تفكيك منصات العدوان و هو ما سيؤذن بولادة مارد عربي هو سورية المقاومة بقيادة الرئيس الأسد و السير في طريق الاعتراف بقوتين نوويتين جديدتين هما كوريا و إيران و الرضوخ لشراكة مالية و اقتصادية جديدة مع مجموعة البريكس التي أطلقت استعدادها لتحرير علاقاتها الاقتصادية من آليات التحكم المالي و المصرفي الأميركي بعد قمتها الأخيرة فإما منظومة عالمية مستقلة و منافسة قابلة للتوسع او تغييرات هيكلية متفاهم عليها تنهي سيطرة نيويورك على شرايين العالم . امريكا حاولت ان توجد لها بديلا في المنطقة يحافظ على مصالحها وتتفرغ هي لمواجهة الصين وذكرنا وقتها ان الامريكيين قد اسسوا لقيام حلفين حلف بقيادة فرنسا ومشاركة تركيا لتقسيم بلاد الشام وإدخاله في الحلف وهذا هو من يقود الحرب على سوريا ،وحلف آخر بقيادة اسرائيل ويضم عرب البعير لمواجهة ايران على ان يجتمع الحلفان اولا بالحرب على سوريا ثم بعد الانتصار على سوريا كما حلموا يتوزع الحلفان كل حسب مهامه ،وبناء على قناعة امريكا بتحقيق الانتصار على سوريا وان مخططها سينجح بدأت التخلي عن المنطقة لتعزز تواجدها في بحر الصين لخوض معارك جديدة في كوريا . ان فشل امريكا وحلفائها في سوريا جعلها توحد الحلفين وتلغي الحلف الفرنسي التركي لتضم مهام الحلف الاخر وهو الاسرائيلي ودول البعير وتكون فرنسا وتركيا داعم لهذا الحلف على ان يتم استدراج مصر لاحقا . كان الامريكي متيقنا بأنه سيحقق مخططاته لما هو مرصودا لها من قوى ومسلحين واموال ،ولكن صمود سوريا قاده الى التهلكة. المخطط الامريكي كان يهدف لإنشاء حلف نووي تقوده اسرائيل ويستطيع هذا الحلف الوقوف بوجه ايران وروسيا وبالتالي تنفرد امريكا بالمواجهة مع الصين . التصرف الروسي الصيني بمواجهة المخطط الامريكي. في عام 2007 كان هناك اجتماعا مغلقا بين الجانب الروسي والصيني والسوري واتفق المجتمعون على اهم استراتيجية في هذا القرن وهي سحب التجارة الخارجية من اليد الامريكية. وكانت خطة البحار الخمسة …التي طرحها الرئيس السوري وتتضمن اقامة نقاط استراتيجية في العالم تقوم باستقطاب الدول الناشئة لمنع السيطرة الامريكية عليها وتقرر ان تكون مركز هذه النقاط سوريا . كان الجانب الروسي والصين على يقين بان الامريكي لن يترك الامر يمر بالسهولة وكان معروفا انه سينتقم من سوريا. كانت النقاط الاستراتيجية لخطة تجارة البحار الخمس هي “سوريا ،واوكرانيا،وروسيا البيضاء، وفنزويلا ،وجنوب افريقيا” وهذه الدول اعتبرت هي مراكز تجمع المنتجات في العالم حيث يتم تشكيل اساطيل بحرية تجارية تعمل عمل سرفيس دائم وبذلك يتم ربط التجارة العالمية بشكل استراتيجي. طرح الجانب الروسي والصيني مشروع معاهدة دفاع مشترك مع الحلف الاستراتيجي ولكن الجانب السوري طلب الابقاء على المعاهدة سرا كي لا تنشأ احلاف جديدة بقيادة امريكية وتم الالتزام بذلك والاكتفاء بإعلان المعاهدة الايرانية السورية التي دعمتها الصين وروسيا . بدأت روسيا بتطوير انتاجها من الغاز وأيضا تجارتها واشترت حقول الغاز في دول رابطة الدول المستقلة مما حرم الامريكي من امكانية النفوذ الى الحدود الروسية طرح الايراني على اذربيجان مشروعا مشتركا هو نقل الغاز عبر اراضي ايران ثم نقله الى سوريا عبر العراق ، كانت تلك المشاريع تشكل صدمة للأوربيين الذين عرفوا ان مصيرهم اصبح محتوما بيد الروس ،وأما الجانب الصيني فقد دعم التوجه الكوري بضرورة رفع العقوبات عن كوريا واعتراف امريكا بحدود كوريا وإلغاء حالة الحرب . كان الجانب الصيني يراقب بحذر ردود الفعل الامريكي الذي كان يحاول المستحيل كي يعيق التقدم الاقتصادي الصيني .وفعلا تبين بعد محادثات 1992 وحتى 2007 بان الامريكي هو يراوغ فقط لكسب الوقت . استغل الجانب الكوري اهتمام الصين بأمنها القومي وزاد من تطويره لقواه وفعلا استطاعت كوريا ان تفجر القنبلة النووية وحاولت امريكا التغطية على ذلك لكن الكوريين اعادوا التجربة ثانية وأيضا طوروا مقدرتهم على نقل هذه الاسلحة. اثناء الحرب على سوريا كان الامريكي يحاول جاهدا عدم خلق نقاط توتر جديدة كي يبقى مكرسا كل جهوده لأسقاط سوريا وكان ذلك من صالح الايرانيين والكوريين ، الذين استطاعوا العمل بحرية اكبر ودون معوقات تذكر . طور الكوريون اسلحتهم وكذلك الايرانيون واما الروس فقد اعطوا السوريون كل مايحتاجون للانتصار من عتاد ومعلومات . استطاعت سوريا الصمود ثم الانتصار وبات من المستحيل تحقيق النصر على السوريين وانتقلت القيادة في سوريا من الصمود الى التصدي والهجوم على معاقل العدو من عصابات ومرتزقة . هنا جاء الايعاز الصيني للكوريين بان الوقت قد حان لحرب كسر العظم مع امريكا .اعلنت كوريا حالة الحرب مع اعلان خطة امريكا عبر “القمة العربية” بإنشاء حكومة منفى تطلب التدخل العسكري لاحقا. كان اعلان الحرب من كوريا بمثابة الضربة القاضية للامريكي وقد فهم اللعبة . الحليف البديل اسرائيل ..في الشرق الاوسط يقابله حليف نووي في شرق اسيا يهدد امريكا بكل مدنها ومصانعها. • ترى الصين بان من حق الكوريين ان يتوحدوا عبر استفتاء تشرف عليه وكالات محايدة تشارك فيها روسيا والصين . • ترى الصين ان التوتر في المنطقة منشأه دول مارقة كقطر وإسرائيل . • تعتبر روسيا ان حل الدولتين وعودة الجولان الى سوريا وإعادة الفلسطينيين الى بلادهم كفيل بنزع التوتر. • تعتبر الصين ان دولة تايوان هي اراضي صينية يجب ان تعود الى الصين . • تعتبر روسيا ان ايران دولة اقليمية كبرى ولها نفوذها الذي لا يستطيع احد انكاره وان من حقها تخصيب اليورانيوم للصناعة السلمية. • ترى الصين ان دولا كدول الخليج تملك مخزون نفطي هائل يجب ان لا تبقى بيد افراد ويجب ان تحكم هذه الدول انظمة ديموقراطية وليس اسر حاكمة مرتبطة بامريكا. هذه بعض الطروحات وهي ان تحققت تعنى ان مرحلة امريكا العالمية الى زوال فخروج امريكا من منطقة الشرق الاوسط هو بكل بساطة وقوع هذه المنطقة وأوروبا تحت النفوذ الروسي وأيضا خروج امريكا من كوريا الجنوبية وتايوان هو سيطرة الصين على شرق وجنوب اسيا . ماذا يعني عدم القبول . ان كوريا الشمالية تهدد امريكا وهذا التهديد سيزداد يوما بعد يوم ويصبح مشابها لتهديد حزب الله لإسرائيل الذي حولها من دولة تبحث عن السيطرة الى دولة تبحث عن القبة الحديدية لتحمي سكانها. في الشرق الاوسط هزمت امريكا بكل وضوح ففي سوريا بدأت الامكانيات لإسقاط النظام مستحيلة وأموال امريكا وحلفاؤها لا يمكنها ان تسقطه وبالتالي بدأت الاموال تنفذ وبدأ الجيش العربي السوري يزداد قوة وكل يوم يمر يضعف حلفاء امريكا ويزداد الشعب والجيش السوري قوة ،وأما الحليف الروسي فهو يزداد تشددا ولم يعد يكتفي بالطلب من امريكا بالضغط على حلفائها بل قرر هو اخذ زمام المبادرة والإعلان انه سيمنع بالقوة توريد السلاح والمسلحين وسيفرض عقوبات على الدول التي تتدخل بالشأن السوري ،وهذا ما جعل الاوروبي ينسحب بسرعة ويعلن عدم موافقته على دعم الائتلاف وأيضا على توريد السلاح. علان الحرب الامريكية على سوريا قد يكون خيارا امريكا للتخلص من التصعيد الكوري ولكن ما خبأه حلفاء سوريا كان مخيفا ، فقد سربت بعض الصحف الامريكية ان هناك اتفاق سري سوري كوري ايراني على عدم السماح لأمريكا بالتفرد بأي من الفرقاء وإعلان الحرب على احدهم يعني الحرب على الجميع وهذا يعني ان امريكا اذا تدخلت في سوريا تكون قد اشعلت ثلاث حروب دفعة واحدة منها حرب مباشرة عليها من قبل كوريا وحرب على قواعدها وأذنابها في الخليج وإسرائيل وحرب على القوات التي ستحارب سوريا. هذه هي الخارطة العالمية الان وشيئا فشيئا يتضح الانتصار العالمي على الارهاب والظلم ورأس الحربه التي تكسرت عليها احقاد وكراهية الاستعمار هي سوريا الشامخة العزيزة . By: Ziad Haydar Translated from As-Safir (Lebanon). Syrian President Bashar al-Assad sent a message to the BRICS group, which met last week. He called on them to “help end the violence in Syria immediately,” thus imparting a political role to the emerging international group. Things in Syria are at a standstill politically with regard to the “major players” and very active with regard to the “minor players.” It is a standstill that helps achieve short- and medium-range objectives, none of which serve Syria’s long-term interests. The letter comes after Syrian presidential adviser Bouthaina Shaaban visited both India and South Africa in March, and a similar trip by Deputy Foreign Minister Faisal al-Miqdad to Brazil, China and Russia, where he tried to obtain clear support from those countries. Since the BRICS group was formed in the last decade, it has represented for Damascus a counterweight to the US-led Western axis, which controls and influences international and regional organizations. The BRICS group tends to not interfere in the internal affairs of other states or in civil wars. That became apparent during the Libyan crisis when the BRICS group opposed Western intervention without being able to prevent it, which weakened the BRICS influence. Damascus wishes to see that influence grow. In international forums, the BRICS group is consistent with Russian policy, which supports the Geneva Accord signed last June, and prefers avoiding direct intervention. Diplomats and observers have noted that Russia’s role, despite its continuity and persistence, seems less aggressive. That may be because of the escalation by France and Britain — with US approval — to change the Syrian balance of power on the ground, something being pushed by Qatar and Turkey as was apparent in the Arab summit in Doha. Russia is apparently waiting for a change in the balance of power in the Syrian opposition. Russian diplomats think that the opposition is being held together by external forces, without which it would quickly disintegrate. But nobody in Damascus knows what will be the next step or has put forth a vision. The Russians are sitting back and waiting for their opponents to “fail.” Moscow is convinced that neither side is able to achieve a decisive victory and that 50 mortar rounds on Damascus per week means that the conflict is taking a new dimension of brutality. That also means that both sides are losing. In this context, it is remarkable that the Russian military has kept its battleship in Beirut, even though two weeks ago its destination was Tartous. Russian diplomatic sources told As-Safir that “this is something normal. It is a routine measure designed to deepen the friendly relations and cooperation between Lebanon and Russia,” and that this matter has nothing to do with the discovery of an electronic spy system on the Syrian coast, believed to be Israeli, or that it is part of Russian military moves. Diplomats acknowledge that amid the deadlock, there are clear Qatari and Turkish preparations for the day after the regime falls, if it does fall. The two conferences in Cairo and Istanbul were part of those preparations. The first conference wanted to showcase the presence of Alawites in the opposition. The second conference was attended by Turkish Prime Minister Recep Tayyip Erdogan and was aimed at Syria’s Turkmen. The conferences wanted to narrow the differences between the “resigned” leader of the National Coalition for Syrian Revolutionary and Opposition Forces Moaz al-Khatib and some of the coaltion’s blocs over increasing the representation of Syrian minorities and expanding the opposition structure. The Americans and the Russians agree that Khatib “is irreplaceable as a leader of the opposition” and seek to keep him in place, especially in face of the rising Islamist militants in the opposition and the rising Muslim Brotherhood movement worldwide. The Qatari and Turkish effort is also part of “the day after” plan, which has started considering “sectarian quotas” similar to those in Iraq and Lebanon. All that recalls what happened in the summer of 2011, when official Turkish delegates asked Damascus about its “informal” opinion regarding sectarian quotas, whereby the key military centers will be held by the Christian and Muslim minorities and the bigger sects be given the primary role in the economy and political process. 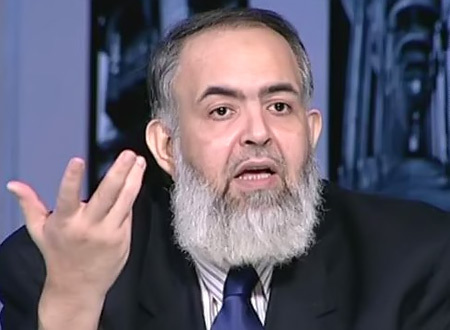 The vision included the possibility that the Muslim Brotherhood will return to Syria. But those ideas were immediately rejected at the time. "Russia is waiting for a change in the balance of power in the Syrian opposition"
(TheBricsPost) – The BRICS just became impossible to ignore. At the close of the Fifth annual BRICS Summit in Durban, South Africa last week, there was little question that this group of five fast-growing economies was underwriting an overhaul of the global economic and political order. The eThekwini Declaration issued at summit’s end was couched in non-confrontational language, but it was manifestly clear that western hegemony and unipolarity were being targeted at this meeting. The BRICS hit some major western sore spots by announcing the formation of a $50 billion jointly-funded development bank to rival the IMF and World Bank. Deals were signed to increase inter-BRICS trade in their own currencies, further eroding the US dollar’s status as the world’s reserve currency. A series of unmistakable challenges were dealt to old world leaders: reform your institutions and economies – or we’ll do it ourselves. Intent on filling a leadership void in global economic and financial affairs, the BRICS also began to draw some firm political lines in the sand. For starters, the summit was focused on development in Africa – a resource-rich continent where competing economic interests have drawn increasingly polarized geopolitical battle lines in the past few years. The BRICS were invited to the African table via their newest member state, South Africa, and have used this opportunity to fully back the African Union (AU). The AU has been Africa’s attempt to integrate and unify the continent economically – via the establishment of a single currency and development fund that could bypass the very punishing IMF – and militarily – via the establishment of security/defense organizations and joint military forces, among other things. AU success would necessarily mean less old-style western imperialism in the region, reducing exploitative foreign economic activities and excluding foreign forces like the US military’s African Command (AFRICOM) from engaging in the African military theater. At the heart of the Summit’s agenda lies the BRICS’ determination to anchor any emerging global order in “multilateralism” – whether by demanding permanent seats within the UN Security Council, forging alternative economic constructs that will shift the balance of power their way, or proactively influencing outcomes in global conflict zones. The Durban summit therefore was not going to ignore the two most prominent issues on UN Security Council’s docket – Syria and Iran. Last week, the BRICS collectively rejected any further militarization of these problems, advocated political solutions negotiated through diplomatic initiatives, expressed concern over unilateral sanctions and warned against infringement on the “territorial integrity and sovereignty” of these nations. The BRICS positions on Iran and Syria cannot, however, be viewed solely within the parameters of the summit’s declaration. For starters, the statement is nothing new – the BRICS have been advocating these points in some form or another since they issued their first foreign policy communiqué in November 2011. To understand the depth and breadth of commitment behind these Mideast stances, one needs to look beyond the sanitized, diplomat-speak of the summit environment. India, Brazil and South Africa, for instance, don’t offer up much commentary on Syria and Iran – they leave that to their UNSC permanent-member colleagues in Russia and China, who are the BRICS’ front-men on these issues. 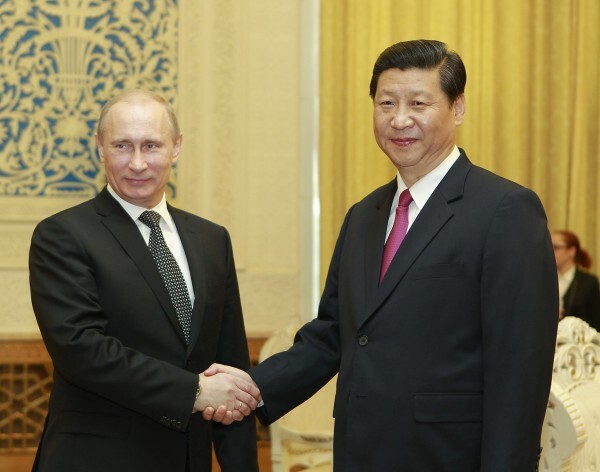 A clear warning against aggressive western interventionism, Xi’s visit with Russia’s Vladimir Putin emphasized the importance of their “strategic partnership” in geopolitical affairs. On Syria, in particular, Russia has taken the BRICS lead with the blessing of its fellow members – including China – so Moscow’s view of the situation is a critical one to analyze. The Russians have recently released a concept paper on the importance of their participation in the BRICS – a view that is likely to reflect similar priorities at the highest levels of fellow member states. But for fundamental economic shifts to take place, a simultaneous rebalancing of political power worldwide must also occur. It’s a bold new world, but there’s real value in some of the old ways. For one, the BRICS are big proponents of the Rule of Law in global affairs, concepts the West often tosses around, but rarely adheres to in pursuit of its own strategic interests, i.e. interventionism, regime-change, militarization of conflict. The BRICS are backing the UN model to help achieve these basic principles. For them, the vehicle is not what is broken – the problem lies with its drivers. And in particular, the notion that regime change, sanctions and military intervention are acceptable tools in international affairs. That letter hit all the BRICS soft spots: Rule of Law in international relations, preservation of global peace and security, peaceful resolution of conflict, de-militarization … and recognition of the importance of the BRICS in the new world order. 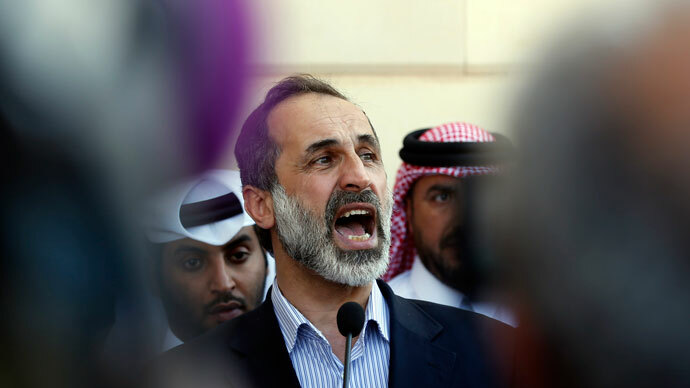 Assad’s letter came one day after the Arab League gave Syria’s seat away to an external-based opposition coalition backed by Syrian foes – a move the Russians called “unlawful and invalid” and a hindrance to the peaceful resolution of the conflict. It may be that BRICS intended to set an example here. Receiving this letter at the summit clearly bestows legitimacy on Assad and his claims – and it is hard to imagine that this was not an event coordinated in advance. Moscow’s positions on the Syria issue cannot be seen out of the context of these shared BRICS principles. The Russians may have more at stake in what is going on in Syria – as others do in Iran – but these are consistent red lines in what the BRICS hope to achieve globally. And they are willing to bet on it too. Part of the wager is that faltering western economies are so far gone on their current trajectories, that only “time” is required for these global shifts to materialize. In any regard, shortly after the Summit concluded Russia vowed to prevent any measure in the UN Security Council to give Syria’s seat to the opposition. The potential for chaos looms large though as a new political order emerges, and as a collective the BRICS will not be shy about pushing their agendas hard – a task made easier by the considerable clout they now share. On his flight back from Durban to Moscow last Thursday, Putin ordered surprise large-scale military maneuvers in the Black Sea, which borders Syrian-foe Turkey – a move most observers took as a warning for foreign interventionists in Syria. It is unlikely that BRICS nations would go to such lengths to draw red lines and not defend those positions. How this would transpire in the cases of Syria or Iran is uncertain – it is unlikely we are going to see a BRICS army fighting battles anytime soon. On the other hand, these strategic relationships are likely to give way to coordinated military positions and some special forces planning for exactly these kinds of scenarios. This is not hard to fathom. BRIC was just an acronym created by Goldman Sachs to describe some fast-growing emerging economies a few years ago. Today, they are engaged in bilateral military exercises, funding banks, building institutions, and remapping global priorities for the 21st century. 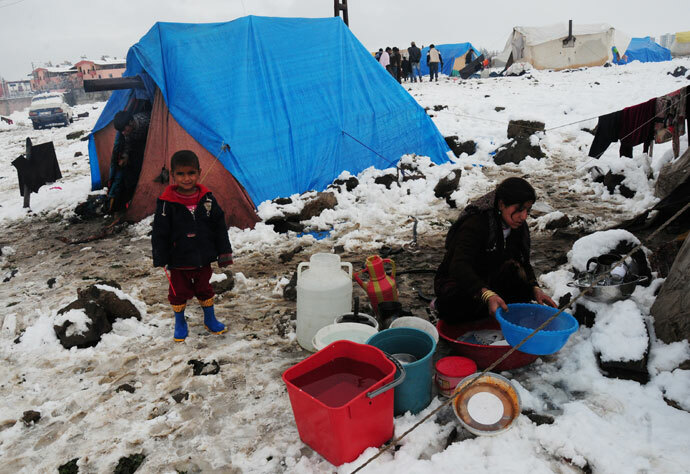 The Russian Emergencies Ministry has announced that it will send humanitarian aid to the Syrian refugees in Lebanon. The spokeswoman of the Russian Emergencies Ministry, Irina Rossius, said this today to the news agency of Itar-Tass. According to the information by the spokeswoman of the Russian Emergencies Ministry, Irina Rossius, an Il-76 plane will soon leave the airfield in Ramenskoye, which is located near the Russian capital Moscow. It is planned that the Il-76 plane will leave the airfield in Ramenskoye tomorrow with a 26.7 tonne humanitarian consignment for the Syrian refugees in Lebanon. Of course, the Russian plane will arrive in the capital of Lebanon, Beirut, and the loading of the humanitarian aid for the Syrian refugees in Lebanon will start today already. Thus, Russia tries to help the many Syrian refugees in Lebanon and it is a good turn by Russia to send humanitarian aid to these people who sure need it, because their situation in the refugee camps is not the best and there were already horrible information about the situation of the Syrian refugees in the camps in Turkey and Jordan. There were already stories about human trafficking, prostitution, kidnapping and young Syrian girls who were forced into marriages for money – and some not only once. Not to mention the organ trade and a rotten Egyptian matchmaking agency who has offered Syrian girls and women for less money to customers, probably old Egyptian men, in a flyer. This Egyptian matchmaking agency has also offered virgins if the customer wants these kind of girls.